In 1974, Johnny Carson decided he no longer wanted to air repeats of “The Tonight Show” on Saturday nights. So NBC created a new show to fill that late-night slot. Phil Ponce: At the Museum of Broadcast Communications, a new exhibition looks at a television phenomenon with strong ties to Chicago. It’s an immersive look at “Saturday Night Live”—its creative process and its history. 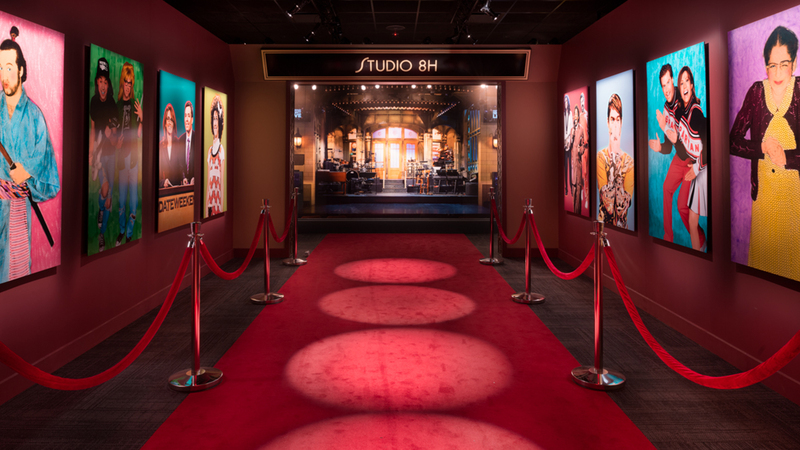 It tells the story through props, including a vast selection from the advertising parodies it’s aired over the years, set constructions from the “SNL” archives and costumes from beloved bits. The exhibition takes visitors through the arc of what it takes to assemble the show each week. Mark Lach, creative director: “SNL” is such a unique way of doing television, there’s really nothing like it, to start with a clean slate every Monday and to have this hard finish line at 11:30 on Saturday night—10:30 in Chicago—is pretty unique. And one of my favorite quotes by Lorne Michaels is, “We don’t start the show because we’re ready, we start it because it’s 11:30,” because it really is this sprint to the finish. So it’s a high-wire act every week and I think that’s part of its appeal. Scroll over the image below to get 360-degree views of the “Wayne’s World” set and Church Lady costume. Ponce: Of course, the show has been packed with Chicago writers, comedians and references from the first season to the latest. Lach: Then you think about the connection that “SNL” has to Chicago, the pipeline from Improv Olympics, from Second City, the talent that’s come through this city onto New York and onto the screen of “SNL” is incredible. For most of us “Saturday Night Live” has been around our whole lives, but there was a time when there was no “SNL” and there was no “SNL”-type TV, a show that kind of made fun of television, disrespected television. At the time there were sketch comedy shows but they were “Laugh-In” and “Hee Haw,” not with any sort of real political gravitas, and “SNL” came along and just kind of wanted to fight the sponsors, fight the network, be that outsider and to this day that’s still there. Now, it still can be silly—you can find the silliest, most sophomoric humor that you can find anywhere, you can find it on “SNL”—but you can also find this hard-hitting stuff too in the political world. Throughout the history of the show “SNL” has kind of been an equal opportunity offender. They’ve taken on both political parties, they’ve looked at both political parties through a lens of “funny” but also trying to make a statement, trying to bring out some of the absurdities of the political mainstream. So “SNL” has done that through its whole history and certainly now with the current political climate it’s at the fore, and people are watching it differently than they did in ‘75. Ponce: Chicago is only the “second city” for the exhibition to visit, following New York. The creative director of the show previously brought the King Tut exhibit to the Field Museum. Here, he takes a less historically accurate approach to the same Egyptian leader. Lach: This is the most energized museum city in the country, there’s no doubt about that, so I had this kind of personal desire to bring it here. It was the perfect fit. You look at this wall behind me of all these faces, 142 I think to this hour that have been on “SNL,” so many have come from Chicago. And when I walk around town and people say, “What are you doing here?” “Well I’m with the ‘SNL’ exhibit”—there seems to be almost an ownership of “SNL” by folks that live here, by Chicagoans, because they know “he got his start here, she was here before she was in New York,” so I love that about how this city, Chicago, seems to want to own “SNL” a bit. Oct. 30: On the 500th anniversary of Martin Luther’s dramatic challenge to the Catholic Church, two local exhibitions reveal the astonishing impact of the Reformation. Oct. 18: Historic clocks from around the world and brilliant stained glass windows fill a new museum in Evanston. We go for a look.